Gorgeous bridal beautiful vintage style garter . 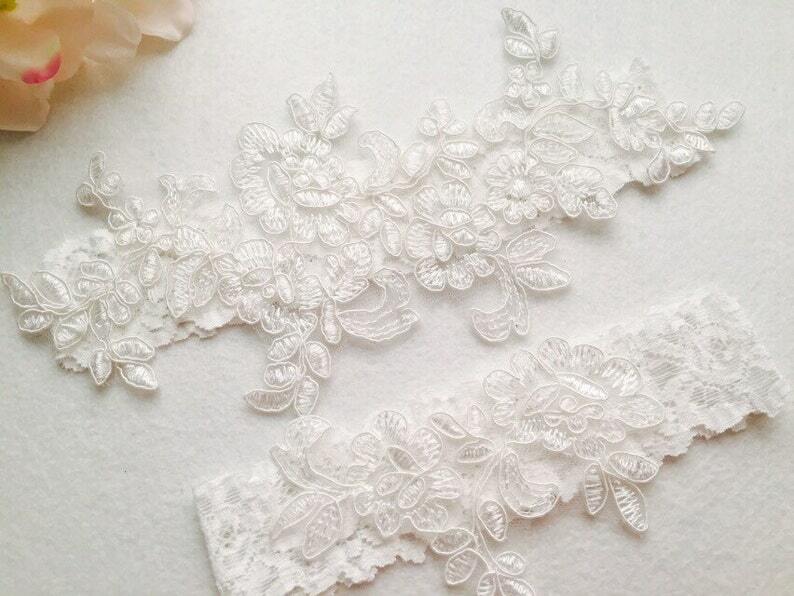 Each garter is made with 1.5inch stretch lace. Please include your thigh measurement at checkout to ensure a perfect fit. Select your thigh measurement in the Size drop-box at checkout. To measure your thigh, use a measuring tape and place it where you would like to wear your keepsake garter (usually 5” - 6” above the knee). You can use a piece of string and place it against a ruler to get your measurement. Please do not take off inches as I will take in the appropriate amount to ensure a comfortable fit. If you ordering both tossing garter and keepsake garter , I will adjust the tossing garter according to the measurement of your keepsake garter. I will complete your order in 3~5 business days ,I will be using USPS first class mail (2~5 days). Also you can Upgrade the shipping . Great! Quality is good. Size was spot on. I am not sure how well it will stay up during the day and all the dancing! But it feels great. Not scratchy at all. Very beautiful. Got here in a timely manner and I am excited to wear it! Came super early and it looks beautiful! Cannot wait to wear it on my wedding day. We appreciate your business! We accept credit card and PayPal payments at this time. You can cancel your order within 3 days after order . Please double check colors, style, size measurement and processing times BEFORE placing your order. If you're not happy for your purchase, you can return and get a refund. The project must be in original ( new and unused ) state on their labels . Items can be returned within 3 days. Please contact us before shipping . In case of return , the transportation costs will not be refunded. And the shipping back to me will be your responsibility. USA SHIPPING: Orders ship priority mail to US addresses only or FPO addresses. Shipping is not insured and our liability stops when it leaves our workshop. We are not responsible for lost, delayed, damaged or stolen goods due to shipping. I will be using USPS first class mail (2~5 days). If buyer missed delivery ,or USPS cannot delivery the package because the address is not deliverable according to their system or because the address is incorrect. The package will be return to us within 1~2 weeks. We are not responsible for any shipping errors and delays due to the post office or incorrect addresses provided by the buyers. Sorry! Goods will shipped to the address of your Etsy , if you wish to ship to a different address , please contact us. Once your order has been shipped , you will receive a tracking number. Please note: All pieces are created by hand, so no two items are identical. Please allow for slight variances .And please allow small flaws And 0.5 feet dimensional error. If you have any question about the goods,welcome to ask me.